Two Dutch researchers recently defended their doctoral thesis on the subject of carbon capture and storage (CCS) (for a typical set-up, see image, click to enlarge). Dr Kay Damen (Copernicus Institute for Sustainable Development and Innovation, Utrecht University), analysed the potential for CO2 storage in the Netherlands, the costs involved and the need for a coordinated international planning effort. His thesis, entitled ‘System analyses of transition routes to advanced fossil fuel utilisation with CO2 capture and storage’ was part of the programme ‘Transition to sustainable use of fossil fuels’ that was funded by the Netherlands organisation for Scientific Research (NWO) and the €5.45 million SenterNovem Stimulation Programme Energy Research. This programme aims to develop knowledge in the natural and social sciences for the transition to a sustainable energy supply. As part of the same program, Dr Saikat Mazumder defended his thesis at the Delft University of Technology on how to better predict routes of the 'underground highways' along which gasses like carbon dioxide (CO2) and methane (CH4) will move during storage operations. He found coal to be highly suitable for filtering carbon dioxide out of waste gasses and storing it. Both works are highly interesting additions to the growing body of research into CCS, which we track because the technology promises the creation of carbon netgative energy systems based on the utilisation of biomass (socalled 'Bio-Energy with Carbon Storage'). According to Dr Damen, CO2 capture and storage can make a major contribution to CO2 reduction in the Netherlands. By the mid-21st century 80 to 110 million tonnes of CO2 per year could be avoided in the sectors energy, industry and transport. This is half of the current CO2 emission. Moreover, this can be realised against acceptable costs, the researcher concluded. In 2020 15 million tonnes of CO2 per year could be avoided by capturing CO2 in the new coal-fired power stations yet to be constructed. Moreover, existing pulverised coal-fired power stations may also be equipped with CO2 capture installations, although the costs of this are relatively high. In 2050 the reduction potential is estimated to be 60 to 84 million tonnes of CO2 per year, for a scenario in which the electricity production is doubled. By capturing CO2 in industrial processes a further 16 million tonnes of CO2 per year can be avoided. Further if cars are run on hydrogen or synthetic diesel produced from fossil fuels combined with CO2 capture then this could eventually lead to a difference of more than 10 million tonnes of CO2 emission per year. For the production of hydrogen in the transport sector, Damen investigated the thermodynamic performance and costs of decentralised membrane reformers. This new technology makes it possible to capture CO2 against relatively low costs. Damen calculated the costs of the pipelines necessary to transport the captured CO2 to underground storage reservoirs. Gas fields are, in addition to deep saline aquifers and coal seams, the most suitable reservoirs for CO2 storage in the Netherlands. The capacity that becomes available for CO2 storage can, however, be limited by a series of geological factors, including the risk of CO2 leakage via wells and faults. Although the mechanisms of CO2 leakage are known, quantifying the risks is still a challenge. 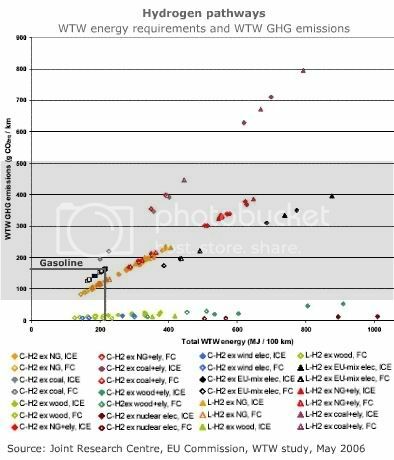 Additionally CO2 storage could compete with the underground storage of natural gas, especially if the Netherlands develops into an international gas 'roundabout'. If the Netherlands has to maximise its efforts on CO2 capture and storage then eventually one of the 'mega storage reservoirs’ will have to be released, for example, the Groningen gas field or large structures in the British or Norwegian part of the North Sea. Saikat Mazumder for his part made it possible to better predict routes of the 'underground highways' along which gasses like carbon dioxide (CO2) and methane (CH4) will move. Moreover, he found that coal might be highly suitable for filtering carbon dioxide out of waste gasses and storing it. The ‘Enhanced Coalbed Methane process’ kills two birds with one stone: carbon dioxide (CO2) is stored in coal seams in the ground and at the same time methane (CH4) is obtained from the process. To optimise this process it is important to know how coal retains and stores some fluids and gasses whilst allowing others through. The network of cracks is essential for this. Mazumder developed a measuring technique using CT scans that led to an improved understanding of the patterns of cracks. He also did experiments with waste gas and pure CO2 to determine the uptake capacity of single and multi-component gasses. In both wet and dry experiments, CO2 was strongly absorbed and CH4 was released. This methane production in a coal seam can vary over the course of time. Mazumder developed two estimating methods to gain a better understanding of this. When used together these could generate good predictions. The research revealed that a considerable quantity of CO2 could be removed from waste gas by allowing it to be adsorbed onto coal under high-pressure. According to Mazumder this means that the injection of waste gas into coal seams can be applied to filter out CO2 on an industrial scale and to retain it. Mazumder also carried out a preliminary study into the decrease in porosity and permeability as a consequence of coal swelling due to the injection of CO2. The decrease in the permeability can give rise to serious injection problems in the area of the well into which CO2 is injected. NWO: CO2 storage in coal can be predicted better - April 10, 2007. NWO: Prepare CO2 capture and storage now for greater environmental benefit later - April 10, 2007. As Brazil steps up its ethanol output and is becoming a global supplier of biofuels, it needs investments in infrastructures to create a smooth logistical chain. A network of dedicated ethanol pipelines is already under construction and now Petroleo Brasileiro SA, Brazil's state-controlled oil company, says it may purchase tankers from Brazilian shipyards to export ethanol as the company moves to quadruple foreign sales of the biofuel. The ships would expand a plan to build 42 vessels for Rio de Janeiro-based Petrobras's fleet of tankers as increased oil, gas and biofuels production transforms Brazil from an energy importer into an energy exporter, said Sergio Machado, head of Transpetro, the company's transportation unit. "We have the land, the sun and the water to become the Saudi Arabia of ethanol," Machado said in an interview at Rio de Janeiro's Sermetal shipyard. "We need to have our own ships to export our output too." Petrobras is in the middle of a US$2.5 billion plan to build 26 tankers for oil, natural gas and other fuels with the first deliveries scheduled for 2009. The plan is part of Brazilian president Luiz Inacio Lula da Silva's plan to revive the country's shipbuilding industry, which in the early 1980s was the world's second largest. Transpetro expects to complete contract negotiations with Brazilian shipyards and Brazil's state development bank, BNDES, for 16 more ships by the end of May. The bank is supplying subsidized loans for up to 90 percent of the costs for the domestically built ships. Petrobras, which is building ethanol pipelines for export, is also considering plans to ship ethanol on barges using the country's river systems, Sillas Oliva Filho, Petrobras' ethanol sales chief, said in an interview March 27. Both Hugo Chavez and Fidel Castro heavily criticized the ethanol deal between the US and Brazil for, it seems, purely political reasons. Venezuela and Cuba had already signed an ethanol cooperation agreement amongst themselves before the US and Brazil did the same, and Chavez had even begun to invest considerably in domestic biofuel production. Castro's critique was mainly aimed at corn ethanol, which, he says, takes up so much land and yields so little energy that it will push up prices of food and threaten the poor. On this, the Cuban leader certainly has a point. The issue has opened a lively discussion amongst leaders from the left on what kind of development pathway Latin America should follow (earlier post). But apparently, biofuels as such are not the real issue because Venezuela's ambassador to Cuba announced his country will step up its own ethanol output even further, despite its earlier criticism. Ambassador Ali Rodriguez said the initiative will produce additives to the gasoline it exports to the US as well as a substitute for gasoline sold domestically. Assessments by the Inter-American Development Bank show that Latin America can replace only around 30% of the world's gasoline demand over the long term, so Venezuela would not have to fear that much and will remain a crucial oil supplier for the US. Brushing away the projected potential, Rodriguez told reporters in Havana that the increased output is "simply to meet an already existing demand, not participate in (the U.S.) plan, which I would call fantasy, which would try to substitute supplies of gasoline from oil with bio-gasoline". In February, Cuba and Venezuela announced plans to increase sugarcane ethanol production to make cleaner-burning gasoline for cars, by jointly constructing 11 ethanol plants. Cuba had supported ethanol production from sugarcane before the United States and Brazil signed an agreement last month to promote international ethanol use and production. The two countries are the world's leading producers of the alternative fuel, though the US primarily makes corn ethanol. The problem with hydrogen is that it is merely an energy carrier and needs a primary energy source from which the gas can be obtained. If this first source is a fossil fuel, then hydrogen isn't really a clean energy carrier. If the gas is made from the electrolysis of water, which is a rather energy-intensive process, then electricity is needed, and the dilemma remains: where do we get the electricity from? And can't we use this electricity directly in less costly batteries instead of making the detour via fuel cells? Using nuclear energy to split water is very expensive, as are solar and wind power, so these options to make hydrogen are cancelled too. For a well-to-wheel analysis of these different H2 production paths and their costs, see our earlier discussion and the graph (click to enlarge). Two thorough critiques of the costly push towards a 'hydrogen economy' that might not be that feasible at all, were presented here and here. Biohydrogen is probably the most competitive of the non-fossil fuel production routes. There are roughly three main ways of obtaining the gas from biological sources: (1) biochemical conversion (diagram, click to enlarge): chemotrophic or phototrophic micro-organisms are allowed to ferment sugars, under anaerobic or aerobic conditions (depending on the micro-organism) during which hydrogenase or nitrogenase enzymes produce hydrogen directly (on H2 production from cyanobacteria and micro-algae see the last section of our post on biofuels from algae), (2) thermochemical conversion: biomass in solid form (wood, straw, etc) is transformed through gasification into a hydrogen-rich gas, from which the H2 is then separated, or (3) indirectly from biogas: biomass is anaerobically fermented into biogas, the methane of which is further converted into hydrogen (similar to H2 production from natural gas); combinations between biohydrogen and biomethane production are being researched as well. Biofusion, a British company specialising in the commercialisation of university intellectual property, has now launched [*pdf] a new company to develop such methods of producing commercial quantities of hydrogen from biogenic sources. The company, called BioHydrogen, will focus initially on a metabolically engineered microbial production method capable of producing hydrogen from fermentable sugars. According to Biofusion, the future of the technology is promising, with initial research results looking positive. "The concept of a hydrogen based energy economy, where hydrogen is produced economically on an industrial scale through a non greenhouse gas generating, renewable process is of significant interest to both governments and the world's major energy providers," commented Biofusion's chief executive David Baynes. But David Baynes of Biofusion thinks making the detour via hydrogen is still worth investigating. He added that "if the initial impressive results can be built upon to deliver a commercially viable production model for hydrogen, then it could be a radical alternative for the production of hydrogen in a future energy economy." The new company will receive an initial £200,000 from Biofusion to aid research, with Biofusion retaining a 60 per cent stake in the company. Biofusion was established in 2002 to commercialise university-generated IP. Biofusion has signed long term agreements with two of the UK’s top ten research intensive universities (University of Sheffield and Cardiff University) giving a combined R&D spend attributable to Biofusion of approximately £114 million a year. Biofusion’s first agreement was a ten-year exclusive arrangement with the University of Sheffield for the commercialisation of IP owned by the University in the area of medical life sciences. Biofusion has shareholdings in a portfolio of 16 Sheffield University spin-out companies including Asterion, Axordia, Celltran, Lifestyle Choices, Diurnal and Phase Focus. The University of Sheffield was ranked 5th in the UK for the quality of its life sciences research and will be spending an estimated £0.5bn of research funding over the lifetime over the life of the Sheffield Agreement. In January 2007, Biofusion completed a long-term exclusive agreement with Cardiff University, to commercialise 100% of all Cardiff University’s research-generated IP. Biofusion has shareholdings in a portfolio of seven Cardiff University spin-out companies including Abcellute, Q-Chip and Cardiff Protides. Cardiff University was ranked 7th in the UK in the most recent research rankings and will be spending over £1.0bn of research funding over the lifetime over the life of the Cardiff Agreement. H2Daily: "Hydrogen From Sugar- A Sweet Idea" - April 13, 2007. Biofusion: Biofusion Launches BioHydrogen Ltd to develop a radical new process of producing commercial quantities of hydrogen from sugar [*.pdf] - April 2, 2007. The BBC has a good overview of the basics of H2 production from micro-organisms, at its H2G2 website. Iowa State University, Office of Biorenewables Programs: Biological Hydrogen Production from Renewable Organic Wastes. European biohydrogen projects presented by the Biohydrogen Network. 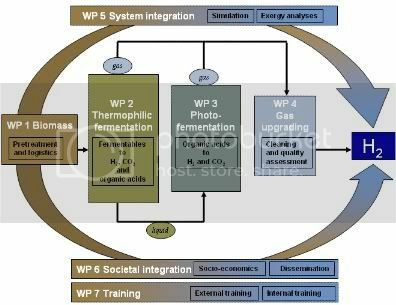 Yokoi Haruhiko, Saitsu Akio, et al, "Microbial hydrogen production from sweet potato starch residue" [*abstract], Journal of bioscience and bioengineering, 2001, vol. 91, no1, pp. 58-63. Brazilian ethanol production is highly efficient and sustainable, in part thanks to the utilisation of earth observation (EO) techniques that allow sugarcane farmers and researchers to plan each plot carefully, to monitor productivity, pests and diseases and a host of other agronomic parameters. From the European Space Agency now comes another interesting example of how satellite images can assist in thorough monitoring and planning of land use. In this case, EO is used to the check the application of so-called cross compliance measures – a set of environmental and animal welfare standards that farmers have to respect to receive full funding from the European Union – included in the 2003 reforms of the Common Agricultural Policy. The ever increasing number of highly finetuned EO-based land use monitoring techniques must make it possible in the future to organise a form of planetary biomass management, that allows us to analyse the optimal distribution of where what types of crop can be grown best, and what kinds of environmental standards should be applied in order to ensure long term sustainability - on a truly planetary scale. ESA's example demonstrates how very high resolution (VHR) satellite images can monitor whether land is safeguarded in 'Good Agricultural and Environmental Condition' (GAEC) - this information consequently ensures EU subsidies are distributed in a fair and timely manner and helps farmers complete subsidy applications more accurately. One of those subsidies involves energy crops, that must be grown on set-aside land. Under the GAEC standards implemented in some countries, farmers cannot remove certain landscape features, including hedges, tree rows, water ponds, walls and single trees, without authorisation of national administration in order to preserve habitats for different organisms and species. By using special classification procedures on VHR satellite images, identification of these landscape features is possible. In combination with digital aerial images, even single trees can be delineated. By comparing older and recent images of these same areas with the processed ‘reference landscape feature’ layer, the removal of these features can be detected. To protect soils against erosion risks and improve soil structure, the GAEC as applied in some countries, states farmers must establish an ‘environmental cover’ for a buffer width, stipulated by the country itself (e.g. 5 metres), around waterways on all parcels adjacent to waterways to restrict diffuse pollution in waters and soils. Pastures, permanent crops, woods, hedges and paths are considered ‘environmental cover’, while mainly arable land and crops are not. Because satellite images allow for the interpretation of agricultural parcels, compliancy can be easily detected. Photo interpretation by remote sensing speeds up the process and allows many parcels to be checked in one time. Tillage practices are also important for reducing erosion as they can reduce the runoff of water across the land surface. The GAEC stipulates that farmers have to plough or plant parallel to contour lines to avoid erosion on slopes more than or equal to a certain percentage defined by the country (e.g. slope of 10 percent). By detecting parcels within this slope range, detecting the slope direction and the ploughing or planting direction, it is possible to calculate the angle between the slope and ploughing direction, taking into account the soil-sensitivity to erosion, and determine whether the farmer is compliant. In order to receive subsidies for permanent crops, the GAEC requires that farmers properly maintain them. Using VHR images, the distinction between crops that are ‘maintained good’ and crops that are ‘possibly maintained badly’ can be detected, allowing authorities to visit the fields in question to detect whether they are abandoned or neglected. This project was funded by ESA’s Earth Observation Market Development (EOMD) programme, aimed at fostering the development of EO data within business practices, and carried out by EUROSENSE, a company that specialises in remote sensing. Movie: By using special classification procedures on very high resolution (VHR) satellite images, identification of landscape features, including hedges, tree rows, water ponds, walls and single trees, is possible. By comparing older and recent images of these same areas with the processed ‘reference landscape feature’ layer, the removal of these features can be detected. Credits: EUROSENSE. European Space Agency: "Satellite images aid implementation of agricultural reforms" - April 13, 2007. European Commission, Agriculture and Rural Development: CAP reform.